To rename a project, first close it, then right-click on it, and select Rename Project. The Rename Project File dialog box will open and you can enter a new name. When you make the project current, it will ask if you want to re-path the project. I recommend that you repath when you rename a project. To move a project from one directory to another, close the project, right-click and select Move Project. A Browse dialog box will appear where you can pick the new location. Moving will automatically repath all the files. You will need to navigate to the new location to make the project current. DO NOT use windows explorer to move a project. WHY ARE THESE OPTIONS GRAYED OUT? To rename or move a project you must first close it. 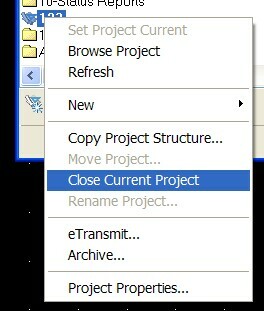 Right-click on the current project name and select Close Current Project. You may also want to close projects when you are working on non-project based drawings so you do not make changes to the project by mistake. This is critical to remember. Get the right project up when you need it and close the project when you don’t need it.